I’ve spent a lot of time talking about hiring an artist to do a portrait. I have so many other concerns: the writing (the finishing! ), the critiquing, the editing, the proofing, the querying, the marketing, the production work, and the cover art. This doesn’t even account for the day job or life in between all the cracks. So why take time and money to bother with a portrait? After all, I can’t even use it for a cover if I go the self-publishing route since the only books that use portraits on the cover are dusty old tomes and biographies. The answer is that this was one of the most rewarding experiences I’ve had in my writing life. I got to meet my character in a way that felt solid. The thrill of looking into his eyes for the first time had my mind churning into creative overdrive. My brain had a new toy to obsess over. My story, very well worn from my years of working it, fired up hot and vivid in my brain. A section of text that I struggled with got easier to mold, to turn over, to play with until I found the right shape. During the time the artist was sending me pictures, I threw out and rewrote the chapters on the escape from Cete Kellen…chapters that had bugged me for years but that always defeated me in hand-to-hand, er, hand-to-keyboard combat. This time, I won. In short, working with an artist to manifest my vision inspired me deeply. I wanted to learn more about this process from the artist’s perspective so I interviewed her. Over the next couple of weeks, I will post the interview. Perhaps you, too, will decide to follow your dreams from your written words to a painted picture, maybe even with Liiga Smilshkalne. Question 1: Who is Liiga? My name is Liiga, and I am from Latvia, where there may or may not be dragons. More specifically, I am from the country’s capital Riga, and the resemblance to my name is merely coincidental. I started dabbling in painting pretty early in life, but it wasn’t until I discovered digital art and decided I absolutely need to know how all these people online had managed to create such wonderful, colorful paintings on this strange, new medium, that things got serious. Although I studied economics and business and afterwards political science in university, I never quite stopped drawing, until at some point I realized that what had initially been a hobby had turned into a job. So I’ve been pretty much continued along the same line ever since. Full interview will be available after the last of the selected questions has published on December 12. 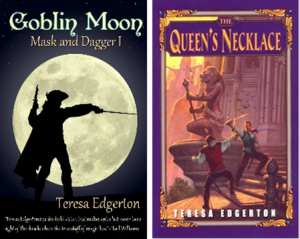 Teresa Edgerton began telling stories as soon as she learned to talk; she began scribbling them down as soon as a teacher put a pencil in her hand; and luckily for us fantasy readers, sixty years later she is still inventing them. Teresa has published many short stories and novels full of wit and charm and intriguing creatures and characters. Her latest releases are Goblin Moon (being rereleased by Tickety Boo Press), and The Queen’s Necklace (being released by Harper Voyager on Kindle for the first time and currently available for preorder on Amazon). Also look for her work under the pseudonym of Madeline Howard. 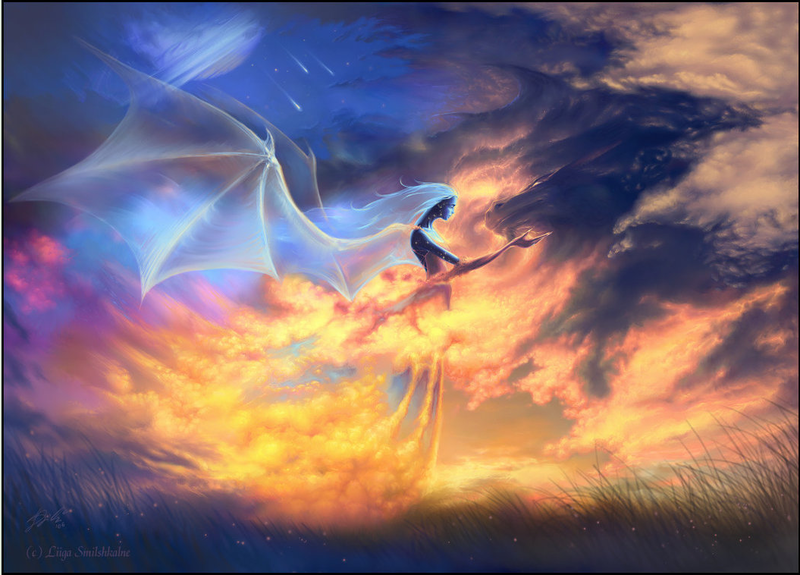 One thing that fantasy writers often forget is the question of how a belief in magic should shape a character’s world view, and how their culture should shape their ideas on magic. In different places and different eras the answer may differ greatly, or sometimes hardly at all, but here I am going to talk about the Western European Medieval era that inspires so many fantasy settings. If real people who believed in magic did not see it as something apart but a natural component of a vastly complicated world, then how much the more would characters in whose world magic is a natural force try to fit it into their idea of the overall scheme of things? Whether they practice magic themselves or have it practiced on or against them, if they want to buy a charm or a spell, they would want to know at least as much about how it works as the ordinary person knows about electricity or the internal combustion machine.